The Stonemaul Clan first made their mark after the Second War. Half would end up in Kalimdor as the Scourge rose, while the other half remained in the Eastern Kingdoms. Those who went west, found trouble in their leader, Kor’gall. With the legendary axe Serathil, he was invincible and proved himself a tyrant, slaughtering any who disagreed with him. Those in the east would run afoul of the Banshee Queen Sylvanas. Their leader, Mug’thol, was possessed. Forced to serve against her enemies, the ogres were treated as fodder. Kor’gall’s tyranny would be his downfall, however, as one ogre escaped his wrath and met the Mok’Nathal Rexxar. Rexxar sought to save the Stonemaul and perhaps gather their help against the Horde’s foes. Despite his strength, Kor’gall fell to Rexxar, and the Stonemaul Ogres joined the Horde at his request. Meanwhile, Sylvanas would order Mug’thol to recover an artifact that he would inadvertently put on, breaking his mind control. Re-branding his newly free half of the clan the Crushridge, Mug’thol proved to be a slippery opponent for Sylvanas, and survived multiple assassination attempts. You start the game as an ogre in a gladiator’s barracks. You are a celebrity gladiator, a member of the Stonemaul Clan, who escaped the other continent in fear of the fel magic being used by the Horde. This Empire conscripted you as gladiators, but being fellow ogres, they have treated you mostly well. You don’t truly have freedom, but they do not put you in the same fights to the death. You make your way to the coliseum, seeing a pristine city of monuments and gilding, not simple barbarism. Upon arriving in the coliseum, you participate in a series of fights alongside other Stonemaul ogres, including your friend, Mug’thol. Just when you should be done for the day, another fight is called. You discover that Kor’gall, chieftain of your clan and your biggest rival, has somehow arranged for you and Mug’thol to fight a Magnaron. It’s not a fair fight and it’s unlikely to be safe for the audience. Someone has pulled big strings for this fight… but you’re ready. Ogres aren’t all about strength, and you manage to take down the Magnaron in an epic fight where you climb atop him and bring him down. As the Magnaron falls, the arena is shaken by a great quake. A moment later, another quake follows, even stronger. As a piece of the arena breaks down, everyone suddenly realizes that the earthquakes have nothing to do with the fight. You hurry to evacuate the arena with your team. Along the way, strange portals occasionally pop open, dumping fiendish creatures in your path. After fighting through the demons and escaping onto the streets, you follow the crowds to the forum, where the populace hopes to get some answers. Several senators are there, trying to calm the nearly rioting crowd. As things reach their breaking point, the senators cast a combined spell that silences everyone and forces them to their knees. The senators explain that they are under attack, but not to worry as their magic and felbreakers will keep it under control. After sending everyone home, one of the senators approaches you. You recognize each other from a time he had you fight for his personal amusement in the past, and he explains that he was impressed enough with your skill that he will entrust you with important information. Things are not well. One of their sorcerers has discovered that the orcs, with their fel magic, are tearing the planet apart with inter-dimensional rifts. All projections predict that the planet will be nothing more than a charred field of rubble within hours, so the government is desperate, and even the best plans are risky and incomplete. You are tasked with activating artifacts around the district that will create an anti-magic barrier. None can say if it will work, but it’s the only plan that can be completed in enough time. At the last Arcane Inhibitor, a Pit Lord tears through a rift in the air, toppling a great tower and blocking your path. There is not enough time to confront the Pit Lord and climb the debris, but the demon gives you no choice. As the fight begins to turns away from your favor, however, the Stonemaul Clan arrives, holding the Pit Lord down and giving you time to break through the debris. As the ground and the very air begins to crack around you, you activate the Arcane Inhibitor and… everything goes white. You wake up in Brackenwall Village. It was a dream. A dream you keep having, but each time it feels more vivid. Could it be a memory? You go to Draz’zlib for advice. He remarks that it is possible it’s a memory, since the fel energies that have laid the ogres low have affected them in both body and mind. But if it’s a memory, it asks an important question. If the Stonemaul Clan was on Draenor when it exploded, how did they end up on Azeroth? You gather ingredients for a ritual Draz’zlib wants to try, and he probes into your memories. Everything goes white once more, but this time you wake up back in the ruins of the Roman city. Just by where you lay, at the Arcane Inhibitor, the land simply stops, dropping off into a chaotic expanse. Nearby, the Pit Lord lays dead, along with some members of the Stonemaul Clan. The ones that are still alive, you arouse, and head back to forum, looking for more survivors. There, you find the populace on the edge of revolt once more. The destruction is unthinkable, and the survivors are angered by the lies of their leaders. Kor’gall leads the riot, while Mug’thol steps in to stop him, pointing out that while the senators did lie to them, their desperate situation gives them no time to fight at the moment. Your first act is to help the other survivors take inventory of what supplies might be left after the destruction. Thanks to the barrier, the city mostly took earthquake damage, but it was a small district so there aren’t likely to be a large amount of supplies for the long term. As you finish up collecting supplies, you discover that a more organized force of the Legion made it into the city before the barrier went up. This group has enslaved the various beasts of the arena, including Maganaron and Gronn, to tear down the Arcane Inhibitors, so they can bring in reinforcements. After saving the barrier, you return to the forum to report, only to learn that the ogres with the most exposure to the demons as the planet tore itself apart are beginning to act lethargic. The various teams of survivors found enough supplies to at least set up makeshift farms and water conjuration for a couple of decades, but this new affliction turns the good news bad. It reminds the ogres of the affliction that mutated their brethren on the orcish continent into simple-minded shadows of their former selves, the very affliction that the Stonemaul Clan had narrowly escaped. Some ogres speculate on ways they might be able to reverse the affliction with their anti-magic artifacts, but they don’t have everything they need left in the city. Options are discussed, and sorcerers go to work to see if there is anything they can do with the disabled Waygate network, which they can use to temporarily pierce the barrier. You help the felbreakers take down remaining Legion warlocks for arcane devices they carry, and bring them back to the sorcerers. With the help of the artifacts, they discover a way to tap into the latent rift energies in the Twisting Nether. After some experimentation, they hope to piggy-back on the residue of the Dark Portal, the safest known portal. An expeditionary force is assembled. Ultimately, they all want to evacuate, and Azeroth seems as safe a place as any at the moment, but the portal is unreliable and they don’t want to put all their eggs in one basket. The senators decide that the ogres showing the worst signs of the affliction should go through, so if the portal fails, the ones remaining in the ruins of the city have the best chance of survival. The sorcerers hand Kor’gall a Waystone with a particular attunement that will allow them to open a return portal once they have secured a safe place to reconnect the worlds. The Stonemaul Clan begins to pass through the portal, but when Kor’gall overhears why they were chosen, he flies into a rage. Mug’thol once more tries to talk him down, and whispers that they’re more likely to survive than anyone who stays behind, but this time he won’t hear it. Kor’gall’s actions cause a riot, and the path to the portal becomes a sea of chaos. Legate Mok’morokk fights his way through the crowd and leaps through the portal, despite being one of the healthier ogres. Due to the confusion, the sorcerers keeping the portal open are losing control over it, and it begins flickering and sparking across the plaza, reminding many of the armageddon they just survived. Mug’thol ultimately decides to challenge Kor’gall for leadership. The fight blocks any attempt to use the portal, so you resolve to end it by forcing them both through the portal. Unfortunately, your actions end up irrelevant for everyone else. As you fall through the portal, the Waygate overloads from the stresses it had endured and the portal explodes. You and your allies wake up in a haze outside the Dark Portal, along with the sorcerers who were powering the portal. You discuss your options, but it seems the unstable portal exaggerated the affliction, giving it to the sorcerers and accelerating it for everyone else. You can scarcely remember what had just transpired. You can remember your homeland, you can remember being raised in the Stonemaul Clan, but recent times are a blur and getting worse every minute. Kor’gall and Mug’thol are still angry, however. The Waystone Kor’gall was given had been broken in the fight, and each take a half before going their separate ways. You, however, can only remember that you knew Kor’gall well, not your strong rivalry, so you follow him, as the memory fades. Back in Brackenwell Village, you tell Draz’zlib to gather the clan, and you tell your story. Tharg, the provisional leader of the Stonemaul, remembers that a strange stone had been passed down between leaders. It was last seen with Mok’morokk. You travel to Stonemaul Hold, from where you do a short scenario where you discover that Mok’morokk had fled to Dire Maul, where he had been raising an army from the ogres who survived the events of the Cataclysm. He reveals that he never truly forgot, but once he managed to install himself as leader, he wanted to show that a Legate could rule better than any Sorcerer-King. The player manages to defeat Mok’morokk and recover Kor’gall’s half of the Waystone. The final piece was last seen with Mug’thol, who has unfortunately gone missing since he managed to escape Sylvanas’ wrath on two separate occasions. Tharg reveals that Rexxar had left a way for the clan to contact him, should they ever be in dire straits. After calling Rexxar, he agrees to help you track down Mug’thol. This leads into another scenario, where you discover that Mug’thol has been hiding out in the place Sylvanas would expect the least: Tirisfal Glades. Mug’thol has set up camp in the Whispering Forest, a place where his Crown of Will protects him from the forces that drive everyone else away. When you arrive, he is guarded, but after you help him fight off assassins sent by Sylvanas, who had intercepted word of your mission, he agrees to listen to your story. After you finish, he remarks that he has been having similar dreams, which he attributed to the Crown. He hands you his half of the Waystone, and you attempt to reopen the portal. It opens partially, but is unstable and chaotic. You realize that the Arcane Inhibitors are preventing the rift magic from fully forming a connection, and the ogre sorcerers who would know how to circumvent it are either on the other side of the portal, or have lost their memories. Together you make a desperate run to Silvermoon as you are ambushed again by assassins. When you finally make it to the city, you are met by Lor’themar. Soon afterward, Sylvanas arrives and demands that Mug’thol be handed over to her. Lor’themar claims that, having allied with the Stonemaul Clan, Mug’thol is now under the protection of the Horde, and Sylvanas is forced to leave without her prize. After you explain your situation, Lor’themar calls for arcanists to make preparations for you, including summoning Ogron and Draz’zlib. It turns out that they do not remember enough to circumvent the barrier problem, as you thought, but hope is not lost. The ogre sorcerers discuss the problem with the arcanists, who decide to bring spellbreakers onto the project. Ultimately, they manage to find a way to use the anti-magic field to their advantage. Together, the ogres and blood elves use the Waystone to open a portal back to the island floating in the Twisting Nether. Immediately upon arrival, you discover that the reason your attempt at the portal opened even partially was that the Arcane Inhibitors have begun to fail over the years. After you fight off some lesser demons, desperate survivors begin to crawl out of the shadows, shocked at the sight of reinforcements after all of these years. You agree to help them, and they agree to help you. Unfortunately, the artifacts they had that would help reverse the fel mutation have been taken by those who are too far gone. Most of the survivors are evacuated, while you, Mug’thol, and the surviving felbreakers go to assault the cache of artifacts. You’re ultimately confronted by the senator you once knew, who has been twisted into a powerful fel ogre. After you defeat the fel ogres and recover the artifacts, blood elf priests arrive with the other half of the reagents the ogre sorcerers needed to complete the spell. You, Mug’thol, and the other afflicted ogres in the city are restored to their old glory as the haze is finally lifted, and your bodies and minds are restored. The blood elves and ogre sorcerers pledge to spread the cure to the rest of the ogres, while you and Mug’thol are approached by Lor’themar and Vol’jin, who had been summoned by his ally. Vol’jin congratulates the ogres on their restoration, and expresses regret that he was unable to help, but wonders who he should view as leader of this reborn Stonemaul Clan. Mug’thol requests that it be he, if the Stonemaul will have him back after his split with Kor’gall, and the ogres, including Tharg, accept. Mug’thol pledges to not just return their body and minds to their former glory, but the grandeur of their people as well. He will not be an emperor, however. 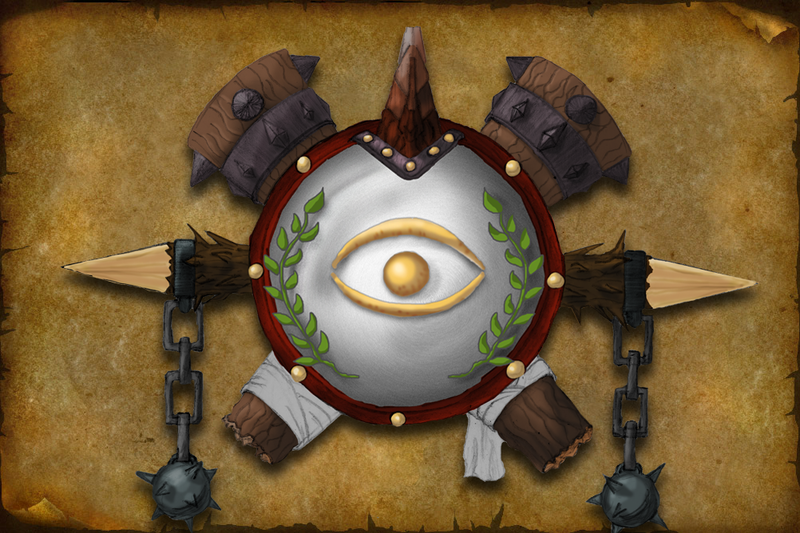 As an ally, not conqueror, of the Horde, he accepts the title of King, and as a gesture of thanks, offers the blood elves use of their artifacts to reinvigorate the spellbreakers. Mug’thol’s first act as king is to take what’s left of the ruined city and use it to rebuild the Stonemaul’s home in Dustwallow, creating a gleaming new city reminiscent of the ogre’s old empires. You, on the other hand, are tasked to assist the Horde and solidify your new place in the world, as you set out on the path of an adventurer. Your big fight for the night is coming up. This is a high profile one, and the patricians expect to see you looking your best. Go clean yourself off while you wait for the match. Watch out though, I heard Segg’Undus made a mess again. You know, if someone doesn’t stop him, ogres from all over are going to get the idea that you can just leave your filth anywhere. When you’re done, report back to me. I heard you’re going to put on quite the show tonight. The inspiration for this zone came when I saw all of the new, Ancient Rome-inspired ogre stuff, and wanted that to be heavily influential on playable ogres. The problem was, I realized that most ways of doing it would have to involve something new, meaning we’d have no connection to these ogres, and they’d have no investment in our problems. So I came up with the idea of exploiting the gaps in the history we have for the Stonemaul Ogres to give them a connection to this more interesting past. My biggest hurdle ended up being who to put as leader. At first I set up an original character, but it felt forced. Then I used Tharg, from the Brackenwall questline, but I realized that in my short story, my original character already received more lore than Tharg’s ever had. I ultimately settled on Mug’thol when I discovered that Cataclysm removed his death and left his ultimate fate open. Even though it feels like the Crushridge name was introduced to resolve the confusion of two separate ogre clans with the same name, I decided to solidify that they were once one, and making it a crucial part of their backstory and future. Mug’thol is pretty much the only ogre that has lore going back to Warcraft III that isn’t dead or irredeemably evil, and his ability to survive Sylvanas’ wrath makes him a much more interesting racial leader than some random original character or questgiver. I imagined this zone with some ambitious, although potentially confusing elements. For instance, in the dream sequence you start in, you play as the ogre you customized, in special gear. Once you awake from the dream, you’d be using the old ogre model, not having any of your customization except skin color. This would eventually change when you find the cure, and your present-day form would finally change to match the more advanced past version that you customized. Draz’zlib and Ogron would have been the two sorcerer-senators that were keeping the portal to Azeroth open, and they were sucked through when it overloaded. This was my explanation for why they are more well-spoken than the average ogre: they had been exposed to less fel energy. I also imagined that “Ogron” was actually a nickname he gained from having an unusual amount of ogron slaves, since that word now refers to a race of proto-ogres. The heavy use of blood elves near the end of the experience may come off as strange to some, but there were two major reasons I settled on them. Their heavy use of arcane magic and teleportation made them a logical choice for the ogres to get assistance for inter-dimensional travel from. Also, what seems to be the origin for the ogre felbreakers seems to relate to spellbreakers as much as demon hunters, and I thought it would be interesting to play off that connection, especially since I like all three. I threw together this edit of my ogre racial icon to show what it might have looked like before the fall of the ogre empires. I mostly just tried to clean it up and replace the more barbaric iconography with Roman elements. After seeing more Highmaul iconography, I probably went too far with this, but it at least still illustrates the shift in ogre history.